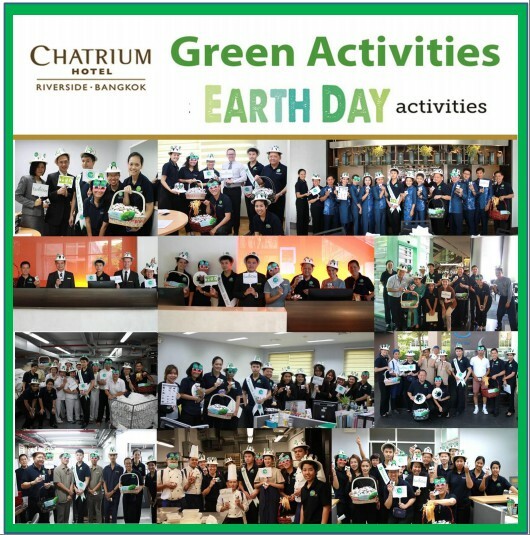 Chatrium Hotels and Residences are wholly dedicated in protecting the planet we all share under the “Think First, Think Earth” theme of Corporate Social Responsibility (CSR) with all properties implementing ideas to save our world. To celebrate Earth Day 2017 Chatrium Hotel Riverside Bangkok distributed coffee wastage to the staff which was donated by Starbucks and also taken from the coffee machines in the hotel’s Food and Beverage Departments to raise awareness that any type of waste has a use and to avoid simply disposing of it without giving thought to the possible practical applications. The staff were encouraged to enter a photo competition showing their creativity in how they used the coffee waste for a number of innovative ideas including deodorizing their closets, using as a fertilizer, removing stains from teapots, exfoliating their skin and even dyeing their clothes – all at a cost of zero baht. The results of the competition showing the most novel idea will be voted on by the Green Hotel Committee.